Sometimes, when travelling through a theatre of war, one comes across a location of such strategic importance that it must have had military significance. 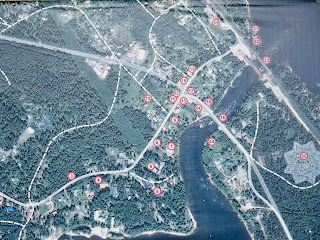 Such is the town of Losevo on the eastern side of the Karelian Isthmus, some fifty miles south of the modern day Finnish / Russian border. A major arterial road and two railway lines converge at the point where the Vuoksa river thunders through a narrow gorge linking two major lake systems. 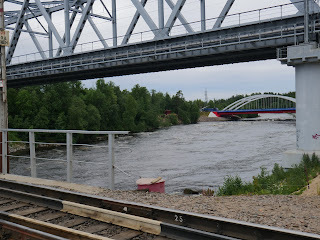 Nowadays there are two railway bridges and one road bridge. Prior to the Winter War there was one rail and one road bridge - both of which were destroyed by the Finnish Army on 6 December 1939. At that time the village was known as Kiviniemi and was well inside Finnish territory. 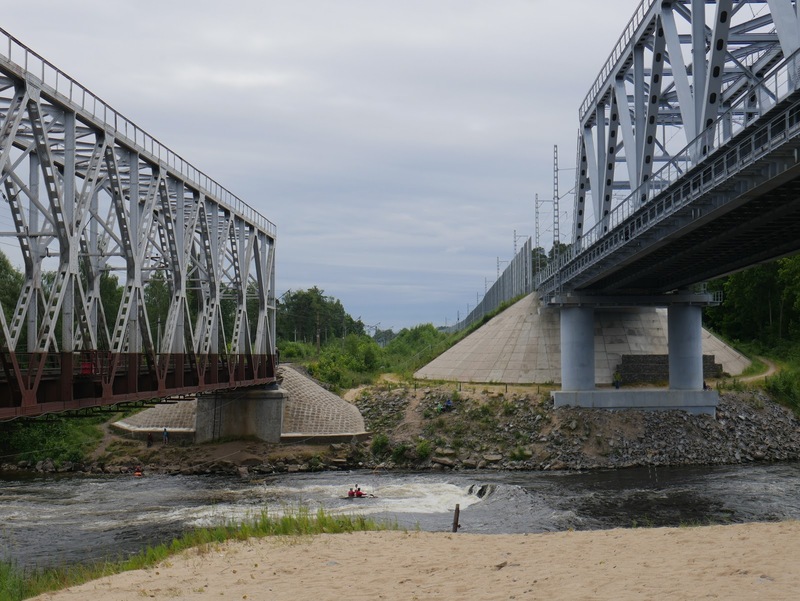 During the 1930s the importance of this sector had been recognised by the Finnish General Staff and the northern side of the gorge was protected by a defensive line anchored on a couple of deep concrete bunkers - these formed part of what has come to be known as the Mannerheim Line. We parked at a petrol station having crossed the road bridge and it wasn't long before we found one of the bunkers concealed in the undergrowth. 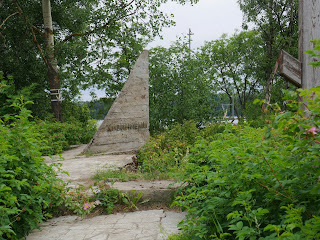 It's location is marked by a crude concrete memorial. 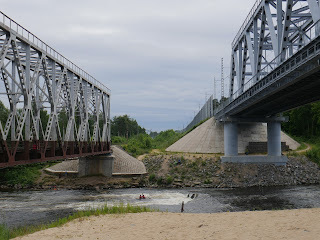 On 7 December 1939 the Soviet 90th Rifle Division attempted to cross the river in darkness without proper reconnaissance. The bridges had been destroyed and the commander of the attacking troops had a choice of pushing his men across the fast flowing, narrow water in the Losevskaya channel or sending them out to the flanks where the nearby lakes were iced over to an indeterminate thickness. 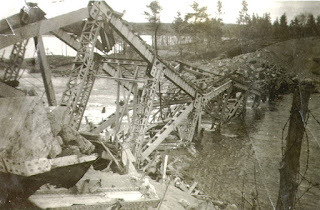 The attacking troops put pontoons across the river but these were destroyed by the Finnish defenders. The Divisional Commander called on amphibious T-37 tanks to support those attackers who had made it to the northern shore but many of these were lost as were the troops stranded on the Finnish side who were unable to scale the icy cliffs above. The decision to attack without reconnaissance, deployment of artillery or inter-unit co-ordination was disastrous and seriously underestimated the determination of the Finnish Army to defend their territory on the line built over the preceding few years. 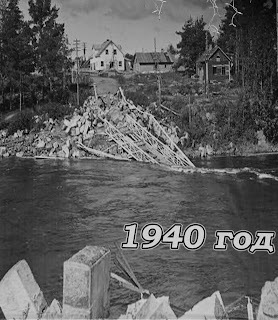 A post war Soviet account speaks of the Finns training searchlights into the gorge just as the attacking troops reached the faster flowing middle section. Tanks turned over in the middle channel and others were swept down the nearby rapids. The renowned Russian poet Alexander Tvardovsky was present and wrote the poem 'The Crossing' as a result. The following day the local Soviet Corps Commander demanded that the 90th Division try again with the help of the 142nd. He was convinced by counter arguments that the attack front should be widened, proper preparation should be undertaken and that their should be logistical support. 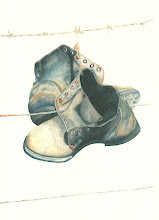 This second attempt was 'stillborn' in a chaotic logistics operation and appalling weather conditions. Thereafter, as far as the Winter War is concerned, the Finnish 8th Division continued to successfully defend this sector until the end of hostilities on 13 March 1940. The story resumes in 1944 when the Red Army launched a major offensive against the Finns who were, by then, isolated by the German Army's withdrawal from Leningrad - westwards through the Baltic countries. The storm broke at 4am on 9 July when a major artillery barrage was delivered by the batteries of the Soviet 23rd Army. Twenty minutes later the 142nd Division forced the river under the protection of their own guns. Losses were minimal and a bridgehead was established - 4-6 km in depth. Attempts by the Soviet 10th Division to break the flanks were less successful so the local commander resorted to a straightforward ferry crossing into the foot of the bridgehead already established by the 142nd. 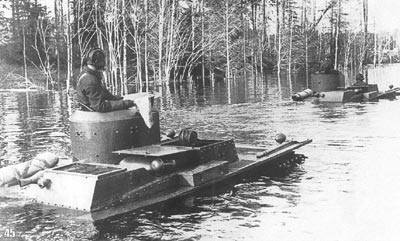 Units of the 92nd Infantry Brigade were also ferried across. Attempts to breakout of the bridgehead continued from the 10th July to the 15th. 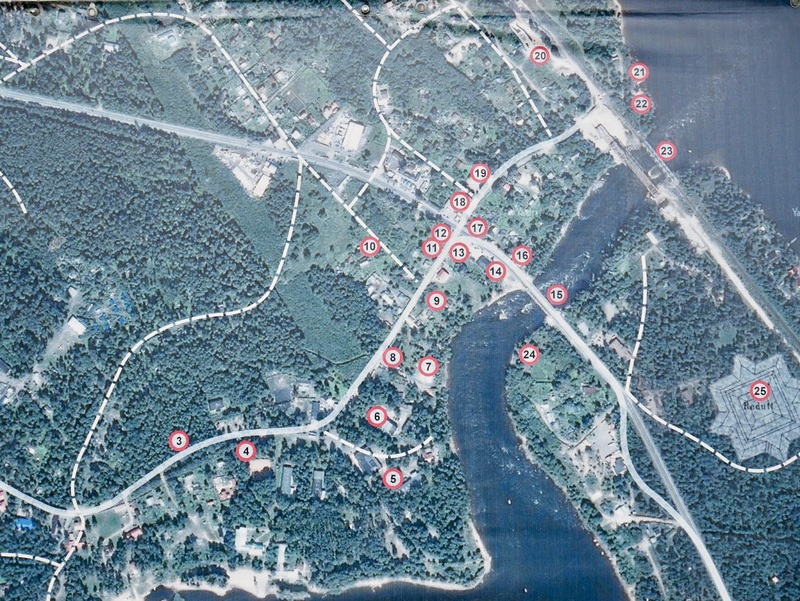 Notwithstanding the fact that the Red Army ferried tanks across, a Finnish counter attack served to contain the bridgehead until several weeks later when breakthroughs elsewhere removed the need to force the crossing at Kiviniemi. Nowadays Losevo is a pleasant little town defined by the road and rail routes which pass through it. The gorge and the rapids are heavily used for canoeing and kayaking. On the northern side there are a couple of restaurants with paths leading down to gravel beaches. 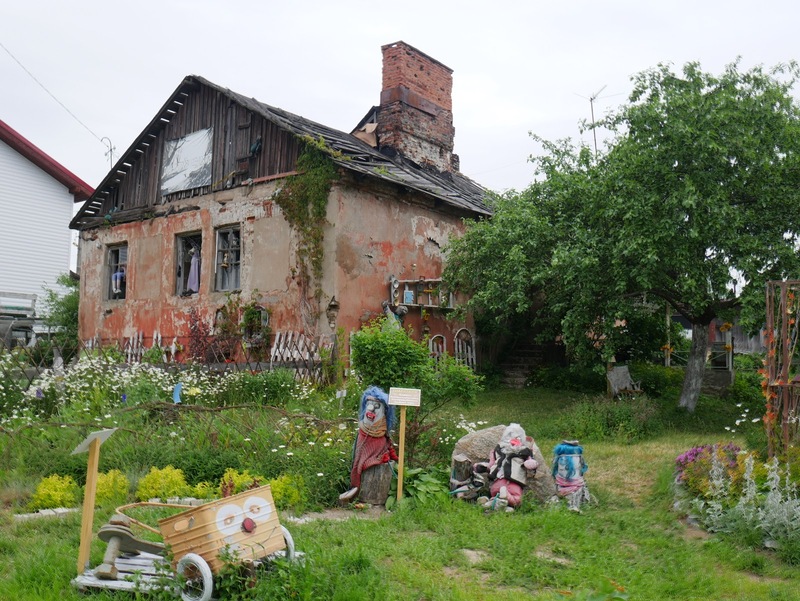 Like many of rural towns in Russia, the place feels 'run down'. 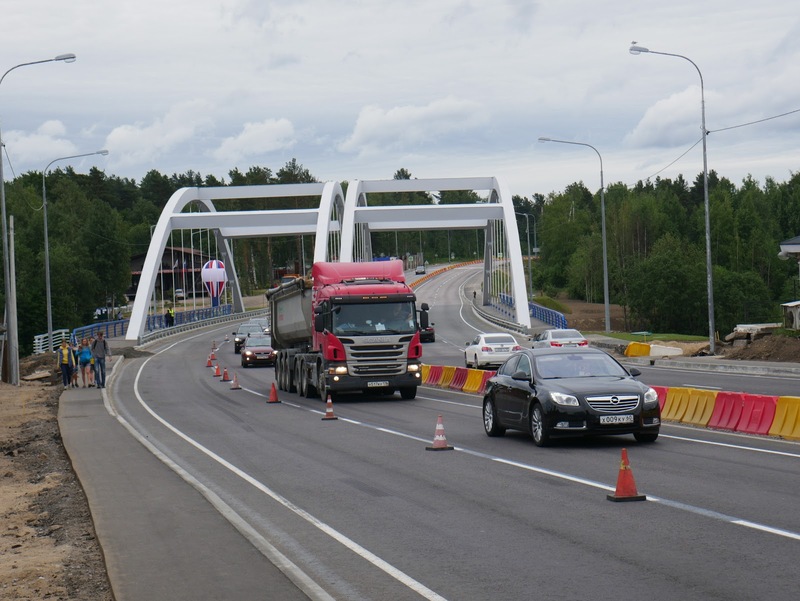 This may change as substantial improvements are being made to the road north to Sortavala and beyond. 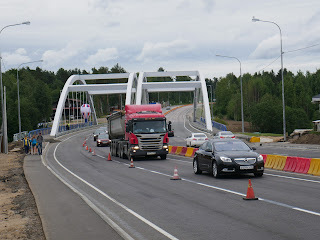 on the route up to the modern day Russian / Finnish border lies the site of the Keksholm (or Korela) Fortress which dates back to the 12th Century. 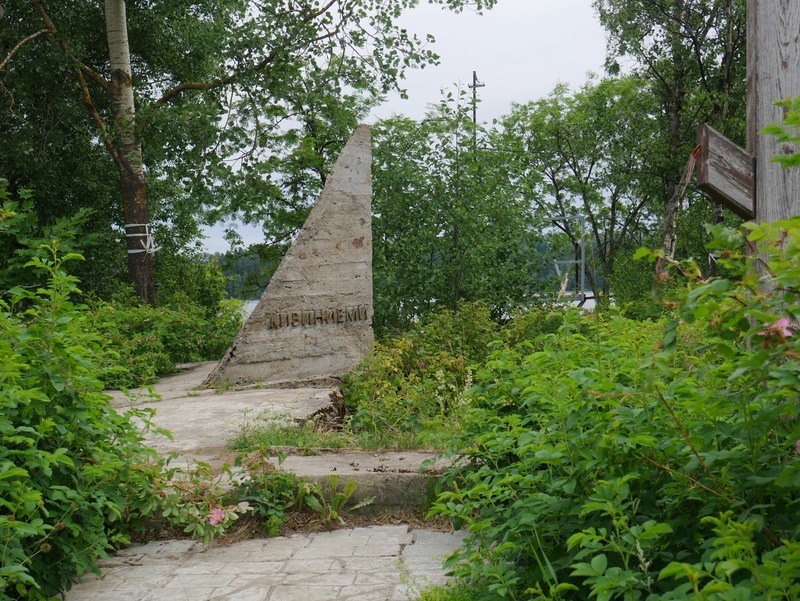 Originally Swedish, the fort changed hands a number of times before being captured by Peter the Great for Russia during the Great Northern War (1700-1721). 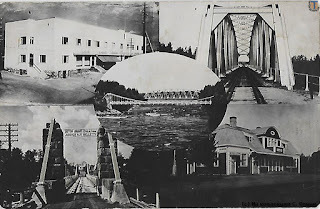 In the early 20th Century the town became part of Finland. Lost to Russia at the end of the Winter War in 1940 it was retaken by the Finns at the start of the Continuation War in 194. 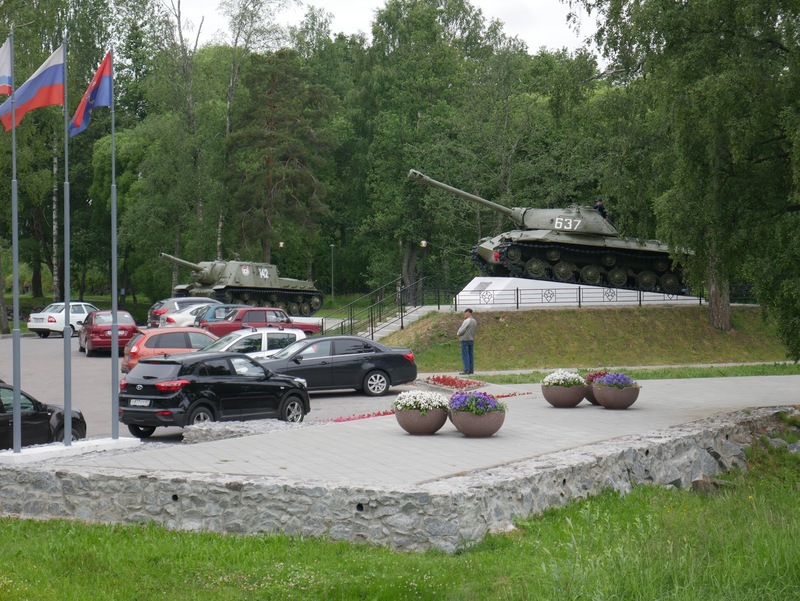 In 1944 the town was again captured by the Red Army whose presence is still felt today in the form of an ISU-152 self propelled gun and an IS-2 (Josef Stalin) tank parked up on the town square.